Things are going well at my two job assignments. Mondays, Wednesdays, and Fridays finds me in the newborn nursery. I am still really enjoying it! Summer is the peak season for births I was informed, and so seems to be the case! On the busiest days there have been 23 or so babies in the nursery. There are always discharges each day as well as at least three new admits. The day there were 23 bassinets/cots, there was literally a pathway constructed between them. It was so full! Wish I could take pictures of the nursery, but I want to be sensitive to privacy issues. The first two days I worked in the nursery, I got teary-eyed when the newborns came in and I got to hold them. Now, I get teary-eyed when I walk in and see gobs of babies and know all the work that lies ahead, haha! Tourist season has been low at the Nazareth Village the last several weeks and will be until September, I’m told. More often than not, there are no guests for lunch so I am out on the land most of the day. My typical work bag I take with me consists of my Bible, a journal, my Arabic review papers, water bottle, and sunblock. Surprisingly, sitting outside for four to five hours a day has not gotten too boring! Usually several tour groups will go by in that time, and I get to listen to the guide describe the significance of whatever site I’m stationed at, usually the threshing floor or the shepherd’s flock. 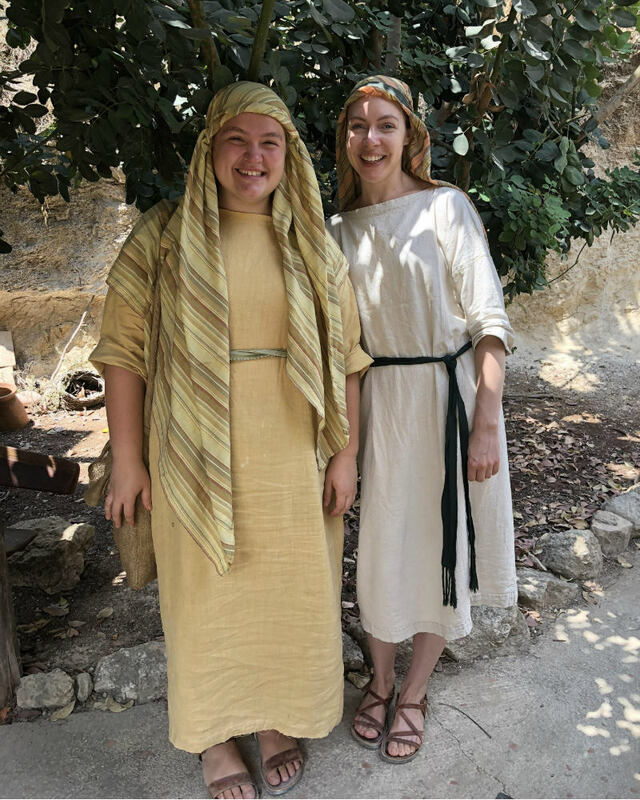 There are various stopping points for the tour- a synagogue, a well, a tomb, a weaver’s house, etc… Look up Nazareth Village on YouTube! There are several great videos showing the tour. Something I absolutely love doing is reading the N.T. while out on the land. When reading about Ruth and Boaz while sitting right next to a replica of it, just bam! Brings it to life. Same for other parts of the tour- reading about the Good Shepherd while a mock Abraham is guarding his sheep, and listening to the tour guides describe the many metaphors of sheep/a shepherd in the O.T. and N.T. is so beautiful. I’m a tactile (hands on) learner, so it has been incredible to have this resource! A cute and spunky donkey named Winston joined the team about two weeks ago! He and his mother Emma are usually out roaming around. The tourists love the four month old donkey! I am super impressed by the staff of the volunteer program SERVE Nazareth. Christine and Jane are two motherly figures who check in on us. Their offices are right here next to our apartments. Every week each volunteer meets with one or both of them to check in to see how things are going and to receive prayer. It’s been a major blessing! I took three Arabic lessons from a local from the Baptist church we attend most Sundays. Wow, Arabic is not easy! But it is still doable. There are no similarities at all to English. It seems like at least when I was learning Spanish, there were some similarities, eg: fruit= fruta. Arabic is purely memorizing words. It also has some sounds that we don’t have in English aka the ‘spitting sound’ and the ‘clearing your throat sound’. Haha! I discovered I have a relative who is also a volunteer here! We are both from Lancaster County, and what started as a conversation about my car not having air conditioning, led to us discovering we are second cousins once removed. Very amusing! 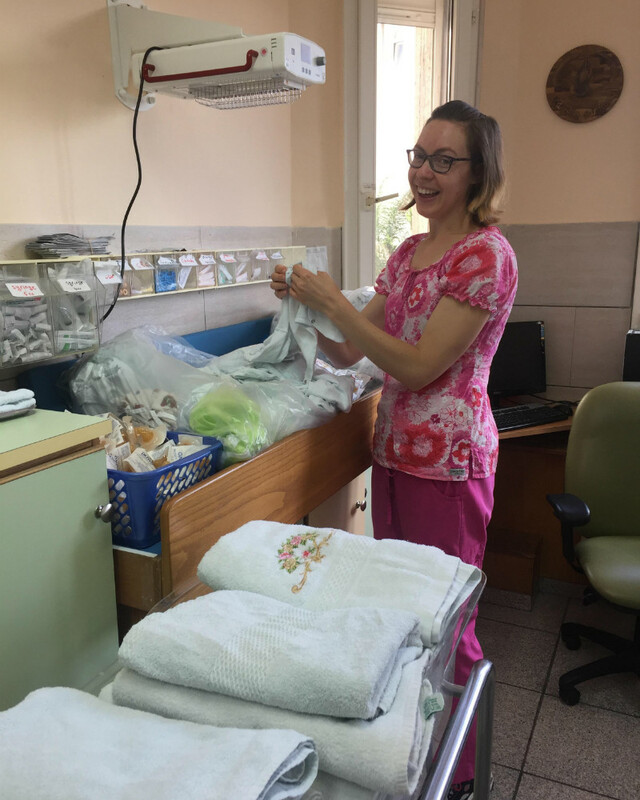 Visit the SERVE Nazareth website to find out about how you can volunteer in the hometown of Jesus.